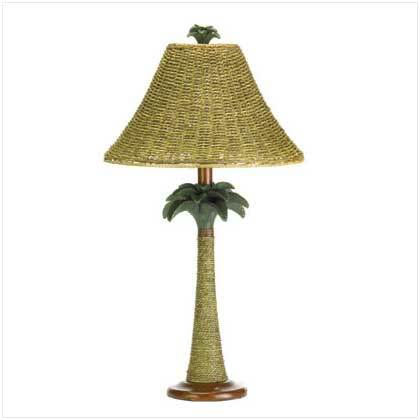 A classic symbol of hospitality, this lovely pineapple lamp will be a welcome addition to your decor! The detailed base features timeless styling and is topped with a neutral collapsible shade to complement right into your living space. 60W Type A light bulb not included. Collapsible shade: 11" diameter x 8" high; base: 5" x 5" x 14 1/4" high; 72" long power cord. 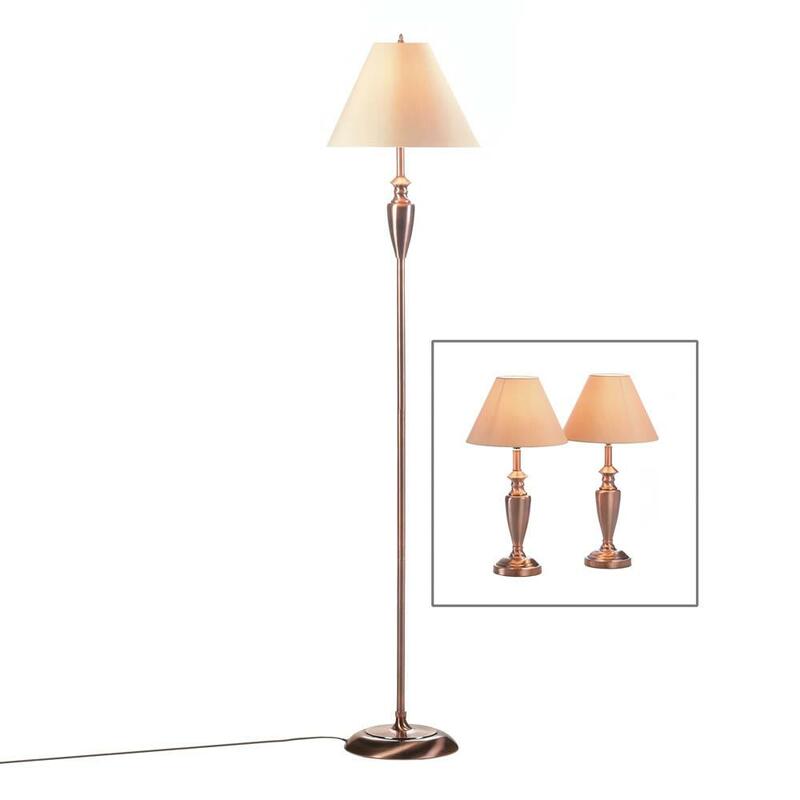 This trio of fantastically designed lamps will fill your room with the warm sheen of rich copper. Two table lamps and a tall floor lamp are topped with neutral shades that will compliment any decor. One 100W Type A light bulb and two 40W Type A light bulbs not included. 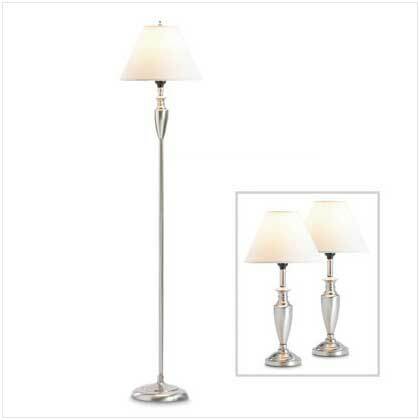 Floor lamp: 14" diameter x 63 1/2" high; table lamps: 10" diameter x 18 1/2" high. 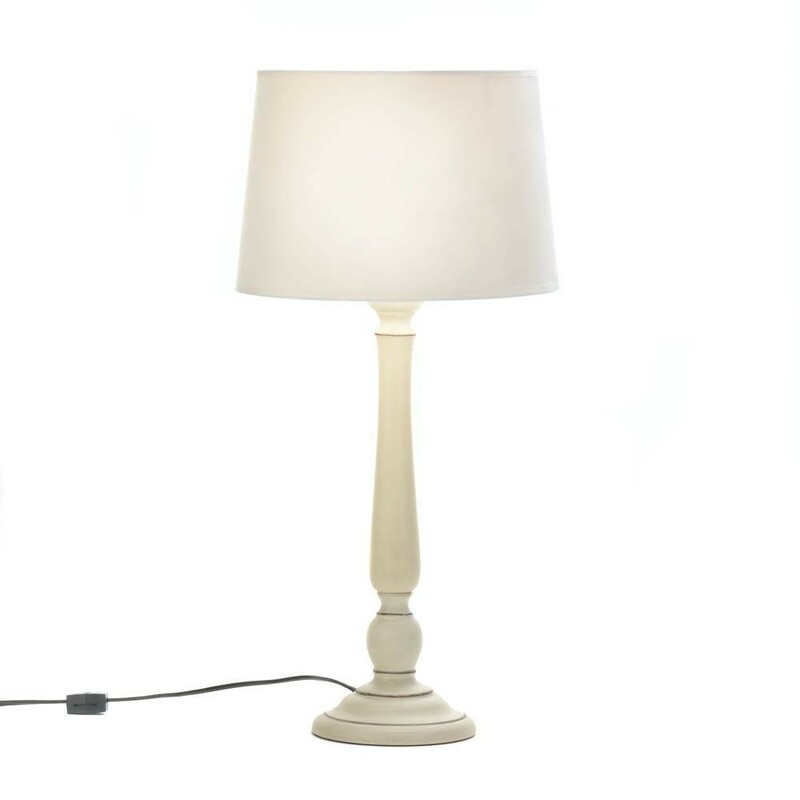 Sleek, slender and oh-so pretty, this ivory table lamp is just what your room needs to enlighten it. The turned ceramic base is topped with a matching fabric shade, creating the perfect lighting accent for any space. LED E26 (60W) light bulb not included. Base: 5 5/8" diameter x 18" high; shade: 11" diameter x 7 5/8" high; power cord is 56" long. 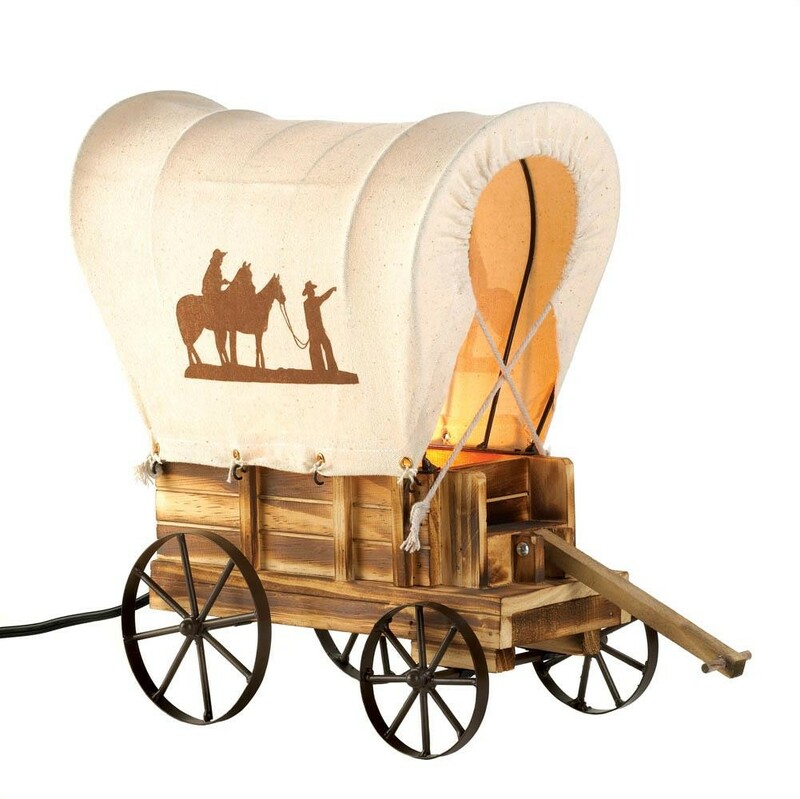 This lamp has a story to tell, and it starts and ends with stylish design! Its dramatic and architectural ceramic base is simultaneously modern and vintage with a unique weathered finish, and its topped by a rich fabric shade. LED E26 (60W) light bulb not included. Base: 4 1/2" square x 14" high; shade: 11" square x 8" high; power cord is 58" long. 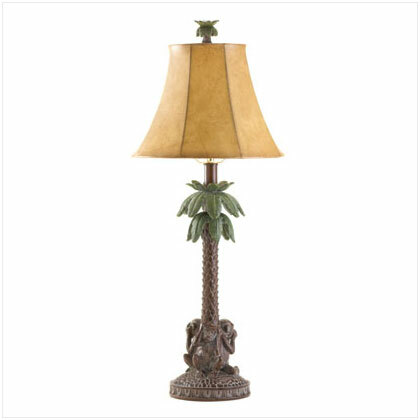 Timeworn and timelessly stylish, this stunning table lamp will shine a light on your home and your impeccable taste in decor. The weathered finish of the turned ceramic base makes a bold statement, and the rich fabric shade is the perfect finishing touch. LED E26 (60W) light bulb not included. 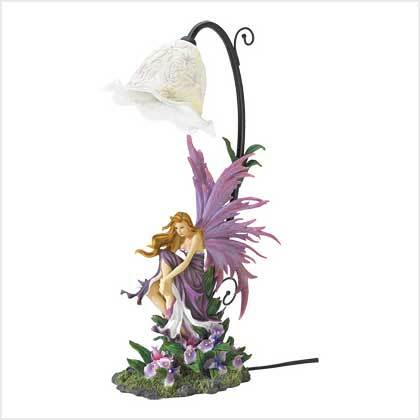 Base: 5" diameter x 13 3/4" high; shade: 11 1/4" diameter x 7 1/2" high; power cord is 58" long. 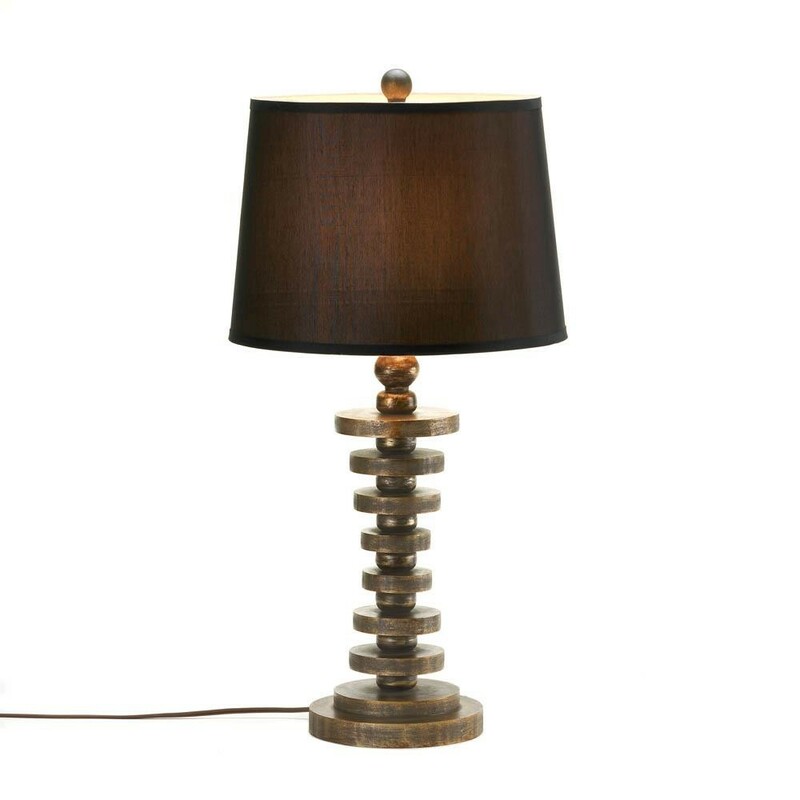 Fill your room with stylish light and gorgeous design simply by adding the Fairfax Table Lamp to your night stand or end table. 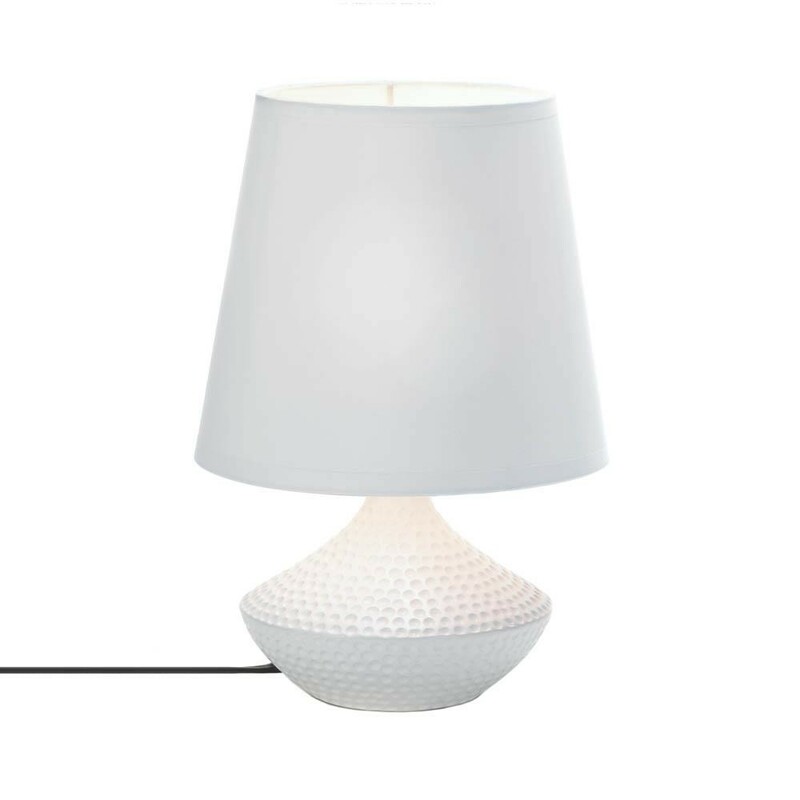 The round, white ceramic base is textured to perfection and topped with a white fabric shade that will help to cast a soft light on your surroundings. LED E26 (60W) light bulb not included. Base: 7" diameter x 10 3/4' high; shade: 11" diameter x 8 1/2" high; power cord is 59" long. 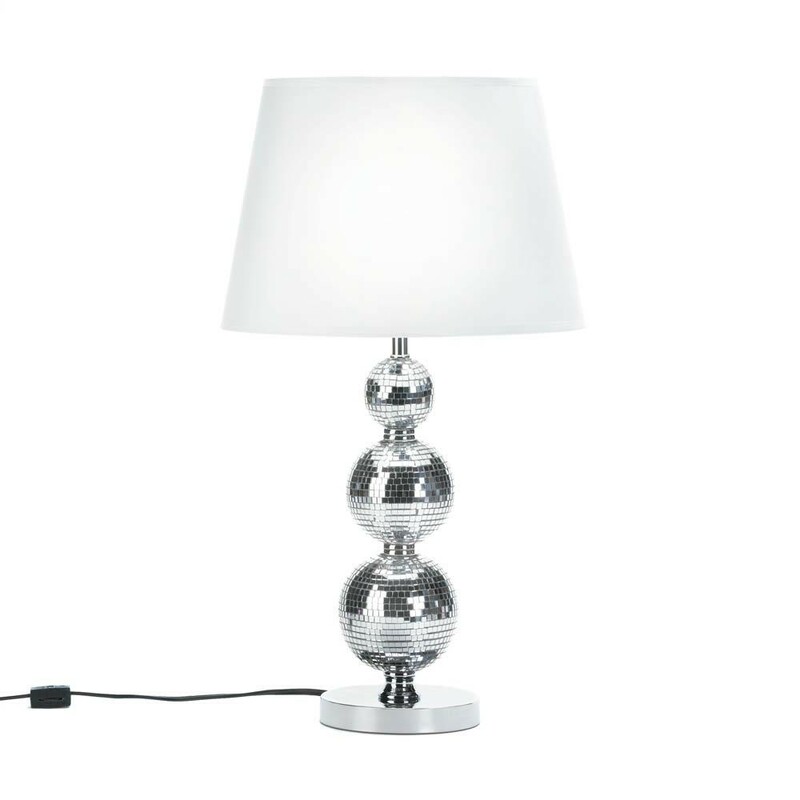 This dazzling table lamp will sparkle and shine, day or night! The circular base features three varied mirrored balls that reach up to hold a white fabric shade. 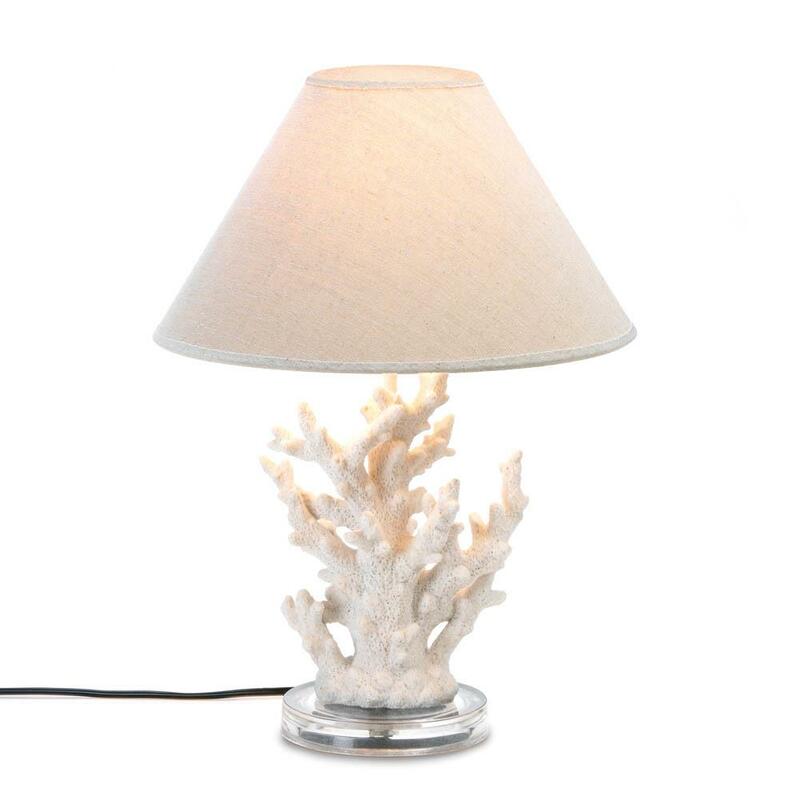 This lighting accent will add glitz and glamour to any room! LED E26 (60W) light bulb not included. 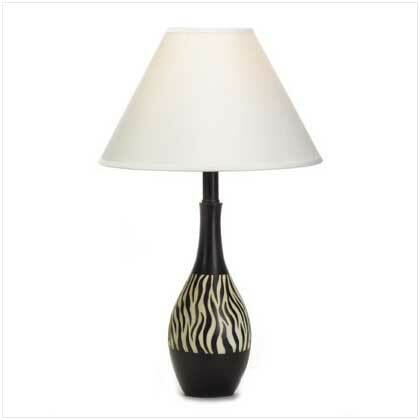 Base: 5 1/2" diameter x 17 1/4" high; shade: 12 5/8" diameter x 8 5/8" high; power cord is 59" long. 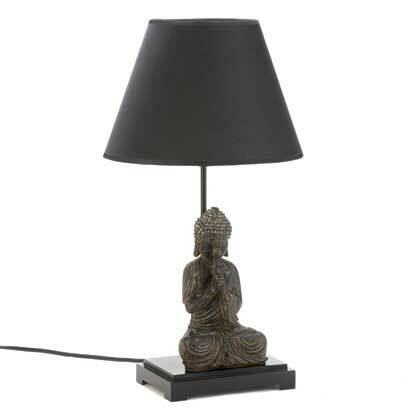 Illuminate your room with breathtaking style with this handsome table lamp. The wooden base features layers of carved wooden discs, and the chocolate brown shade will complement just about any decor. Light bulb not included. Base: 7" diameter x 17" high; shade: 14" diameter x 10" high; 70 1/2" long power cord. Dimensions 14" x 14" x 28.5"
Modern meets vintage in this fantastic lighting accent that will fit into any decor. The metal base features a weathered pedestal and its matching shade is imprinted with vintage handwriting and pretty ornaments. 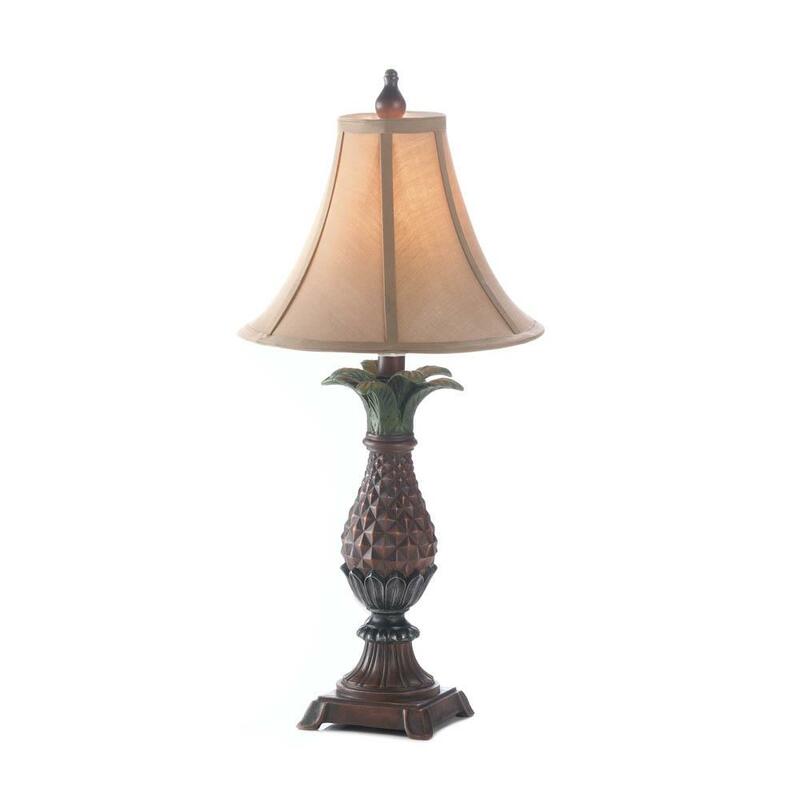 Base: 6 3/4" square x 17" high; lamp shade: 14" x 14" X 10 1/2" high; 67" long power cord. Dimensions 14" x 14" x 29"
10015529 - GLASS ORB TABLE LAMP. 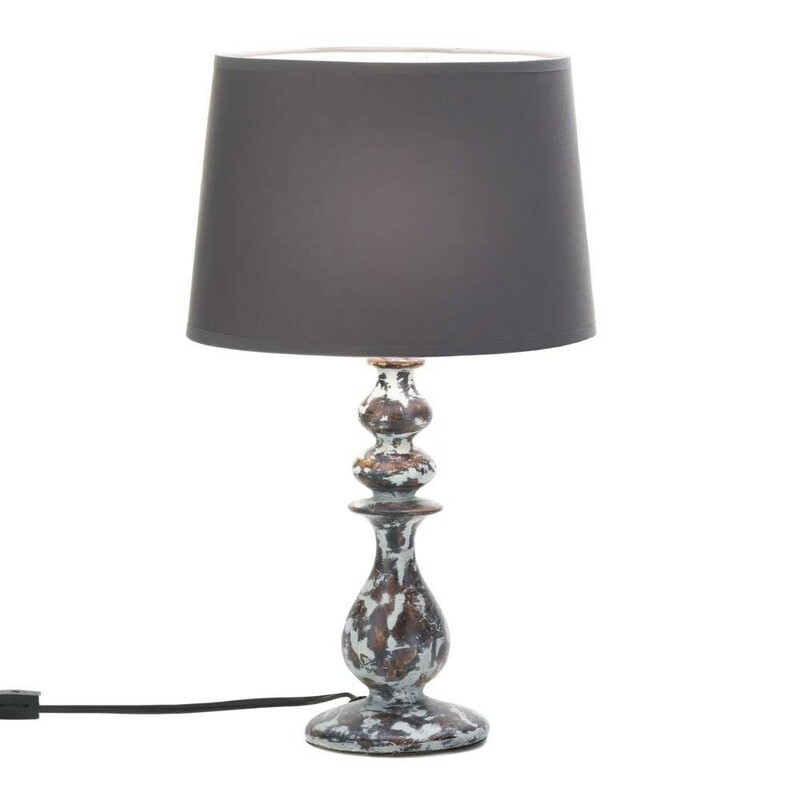 Shed light on your impeccable taste with this stunning table lamp. It features crackled glass orbs and a mocha shade with subtle sheen. 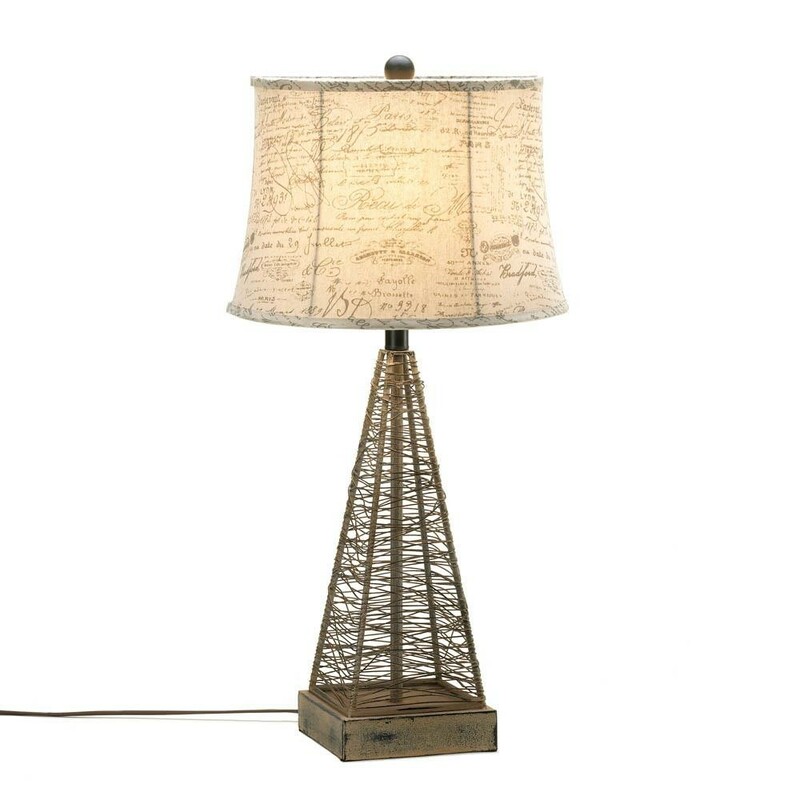 15162 PARISIAN TABLE LAMP! 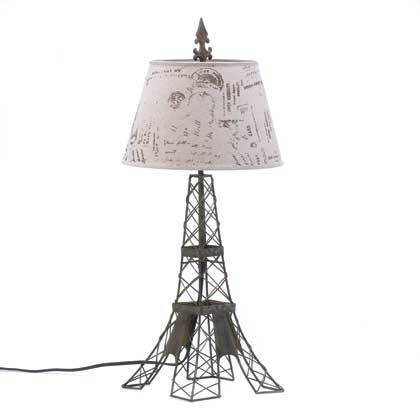 The metal wire frame mimics Paris’ most famous landmark, the Eiffel Tower, fashioned in industrial-inspired metal with a vintage patina. 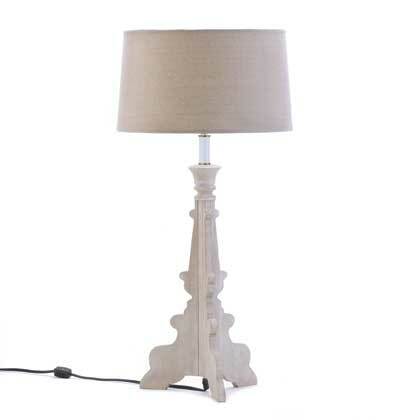 The travel-stamped shade and French flourish on top make this lamp a continental charmer. 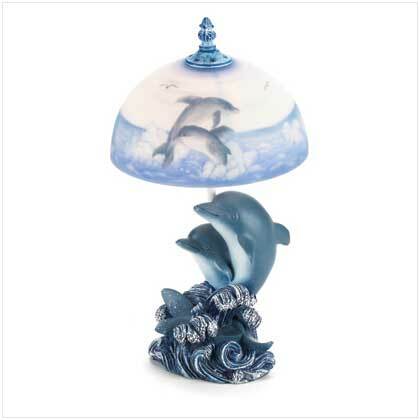 Splendid shape and breathtaking form make this miniature table lamp a powerhouse of style. 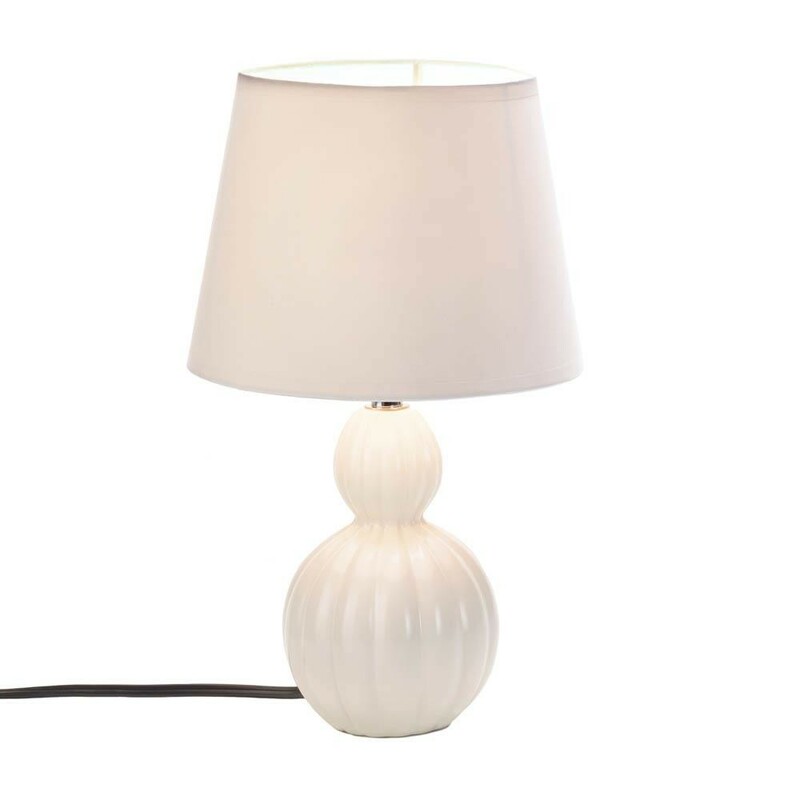 Topped with a white fabric shade, the cinched ivory ceramic base fits into just about any space and any decor style. LED E26 (60W) light bulb not included. Base: 4 1/2" diameter x 9 5/8" high; shade: 8" diameter x 6" high; power cord is 62" long. 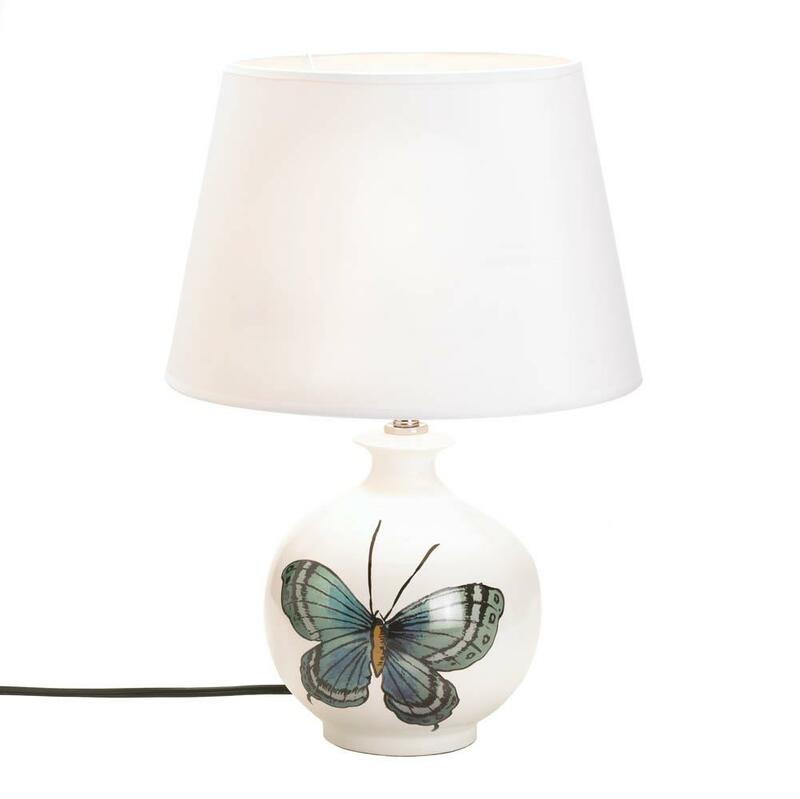 Dimensions 8" x 8" x 13.2"
The dimpled white ceramic base of this modern table lamp is a work of art that also works to illuminate your space! 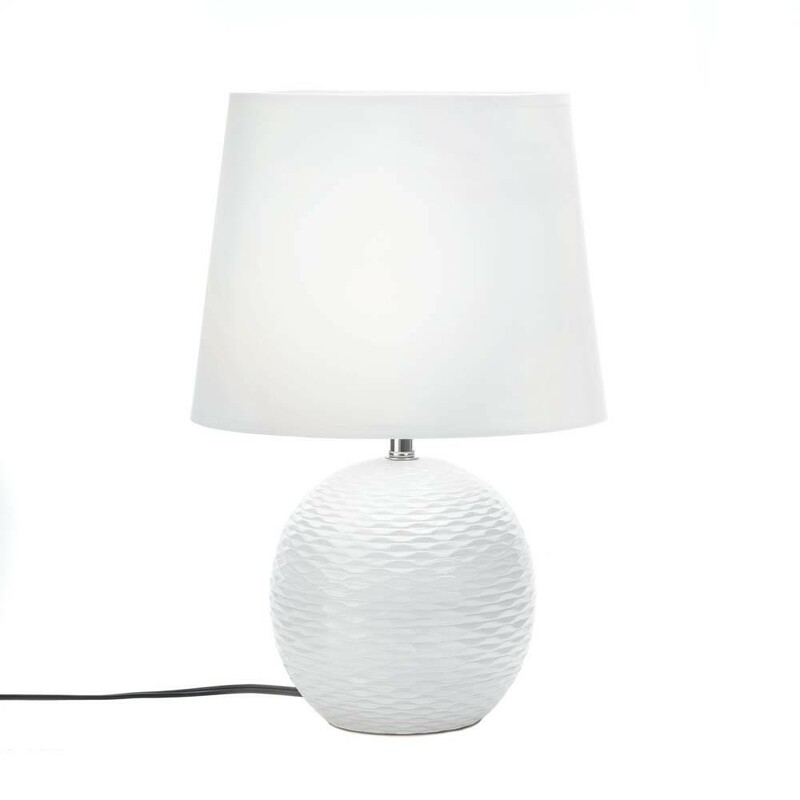 Topped with an oversized white fabric shade, this mini lamp will cast your room in a perfect light. LED E26 (60W) light bulb not included. 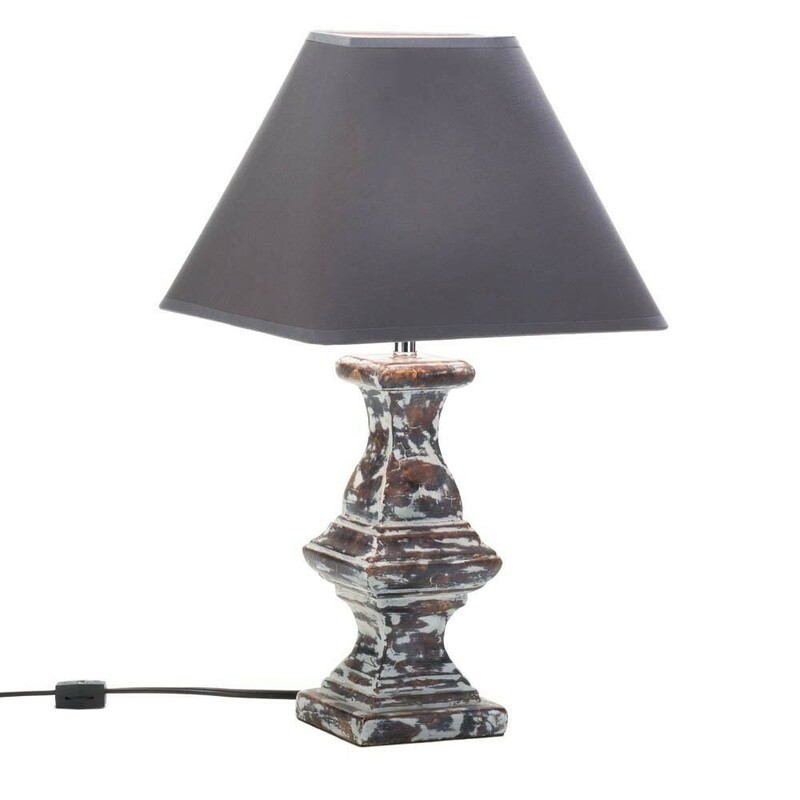 10015530 - RIVER ROCK TABLE LAMP. 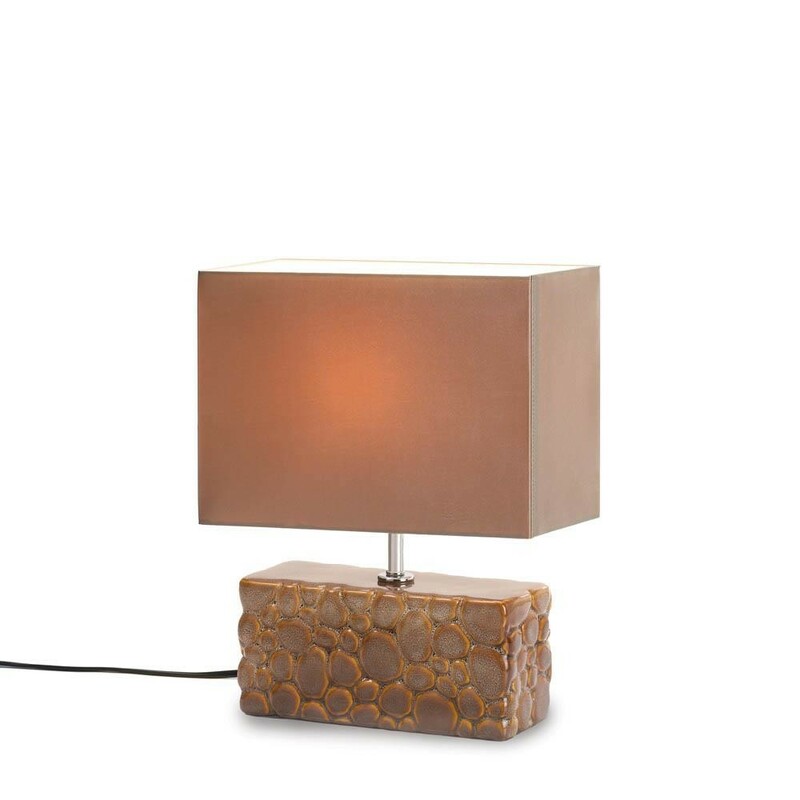 The rectangular ceramic base of this gorgeous lamp is designed and glazed to look like a collection of smooth river rocks, topped with a complementary shade. 60W Type A light bulb not included. Shade: 11" x 5 1/4" x 7 1/2" high; base: 3 1/8" x 8 3/4" x 4" high. 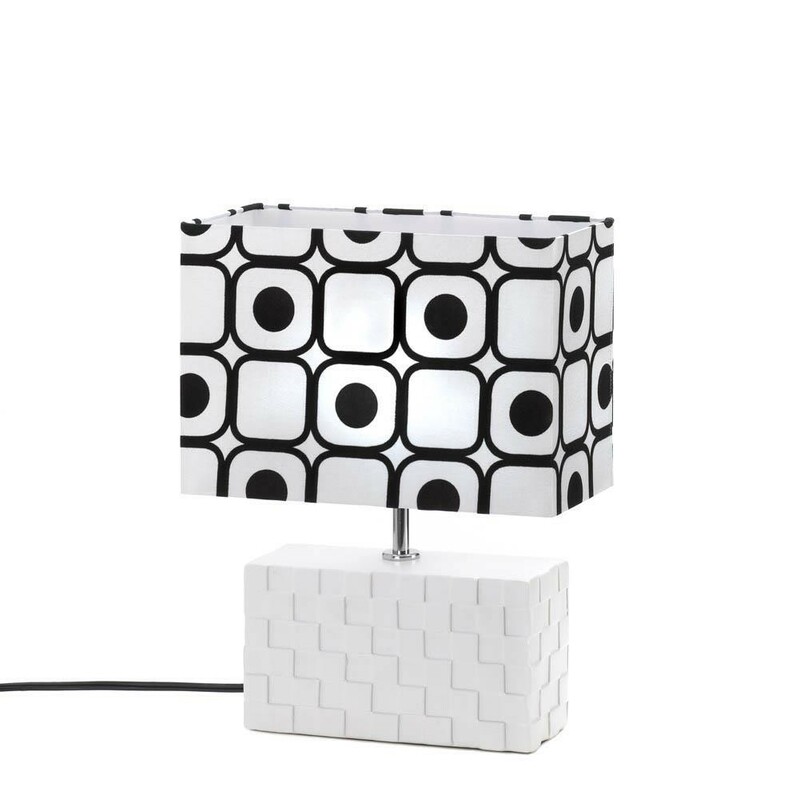 10015531 - GEOMETRIC POP ART TABLE LAMP. 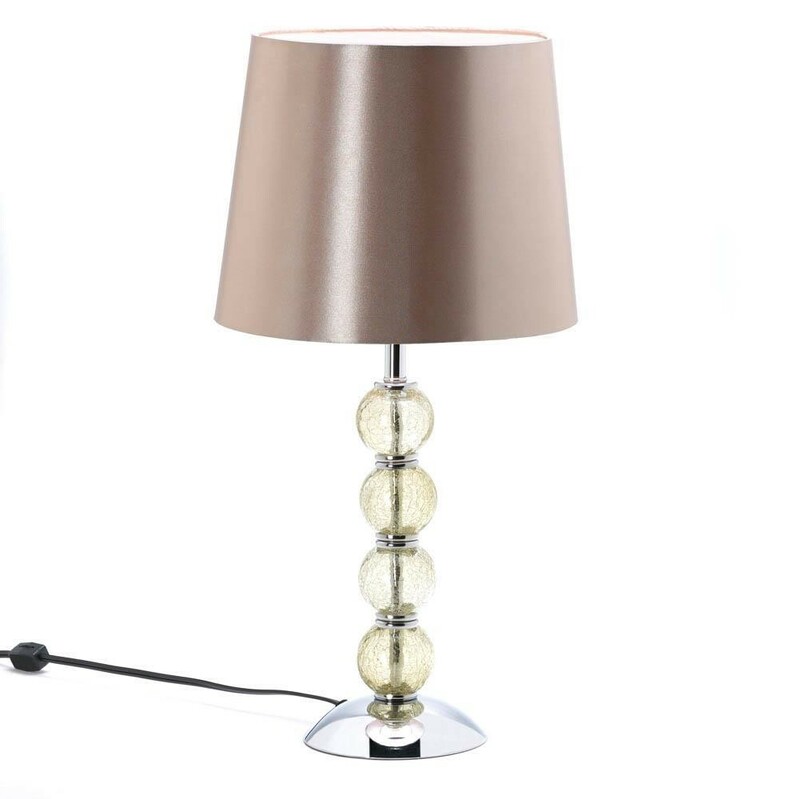 This lamp is the perfect blend of modern and retro style! 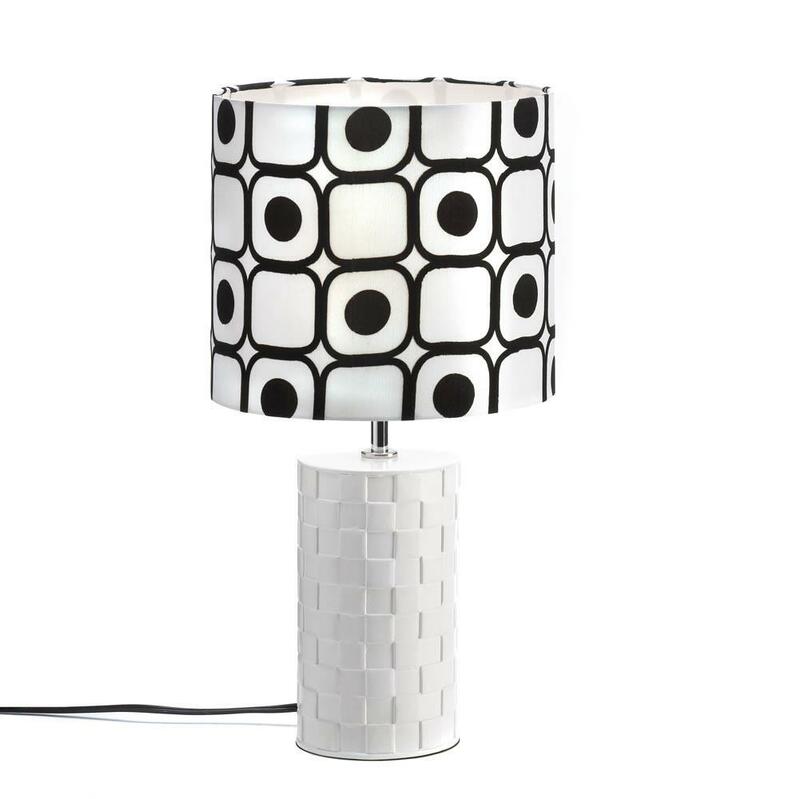 The textured ceramic white base is topped with a mod "pop art" shade with black graphics. 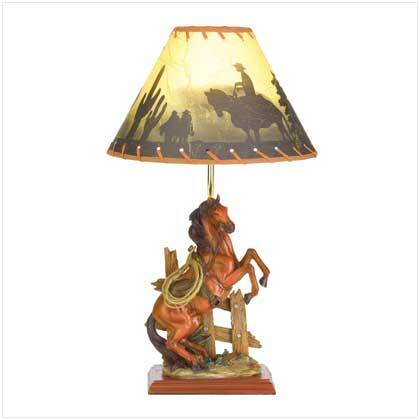 Browse our LAMPSHADES with images! Browse our LAMPSHADES without images! 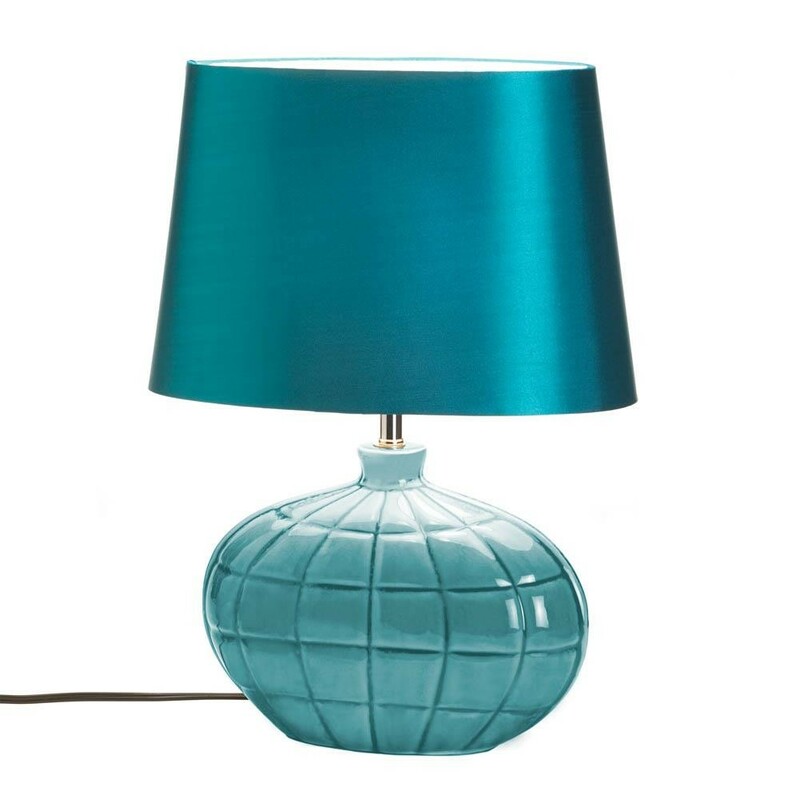 Check our Discounted LAMPSHADES - click here!